You probably won’t actually know what the best shot was until you receive your wedding photos from your photographer and take a look at all of them… Most of the time the best ones are where you’re completely unaware that you were being photographed at all. These kind of photos see you at your most relaxed, and sometimes those unplanned moments, and moments ‘in-between’ staged poses make the best photographs. 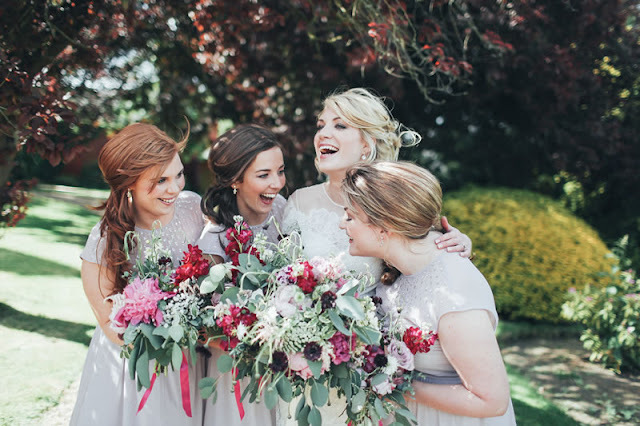 Have fun throughout your big day and make sure your photo theme is light and full of happiness – it’s always good to practise smiling with your partner beforehand but don’t overdo it too much! If you are not having a pre-wedding shoot prior to your wedding, Jess recommends you arrange a meeting with your photographer face to face or via Skype. It’s so important to get to know one another a little before the big day itself, that way the introductions between you have already been made, and you can also ask any last-minute questions you may have for them, too. Why not follow them on Facebook, Instagram and Twitter, so you can stay up to date with what they are doing – looking at their social media will give you more of a feel for the person behind the business itself! This is the perfect opportunity to really get to know the person behind the lens and for them to get to know you as a couple, as well. See it as a practice shoot before your big day arrives, plus it’s a great way to get rid of those camera-shy nerves, and start to get comfortable with the way your photographer works. It’s also a fab opportunity to get some beautiful, more casual photographs of you both, and they won’t go to waste! You could include them into your save the date cards, or incorporate them into your wedding day via a slideshow or table centrepieces. 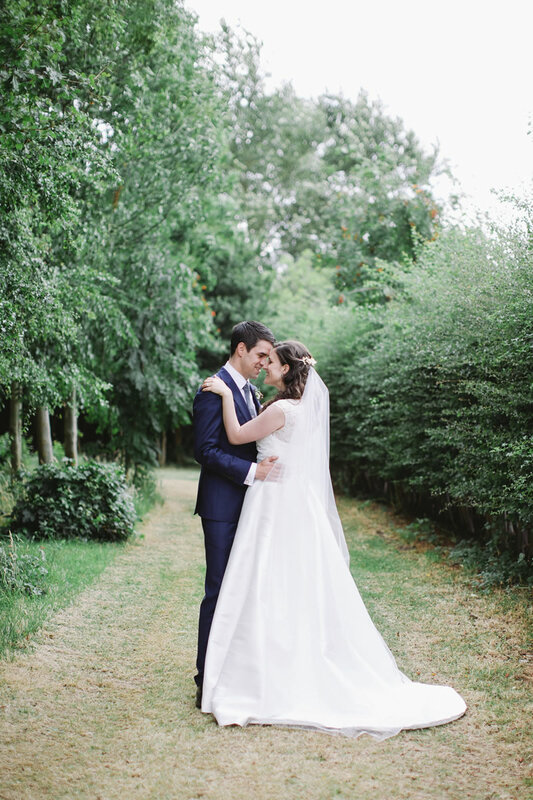 Put aside some time between the end of your ceremony and your wedding breakfast to create some couple portraits of just the two of you – this is the perfect opportunity to have some ‘alone time’ and enjoy each other just after the exchange of your wedding vows. Emotions are high at this point and smiles are constantly being worn, your photographer will be able to capture these beautiful moments between the both of you when you’re so effortlessly happy and glowing with love. You may even want to sneak off for 20 minutes in the evening for further portraits if your wedding is in the Summer, to catch some dramatic sunset portraits. 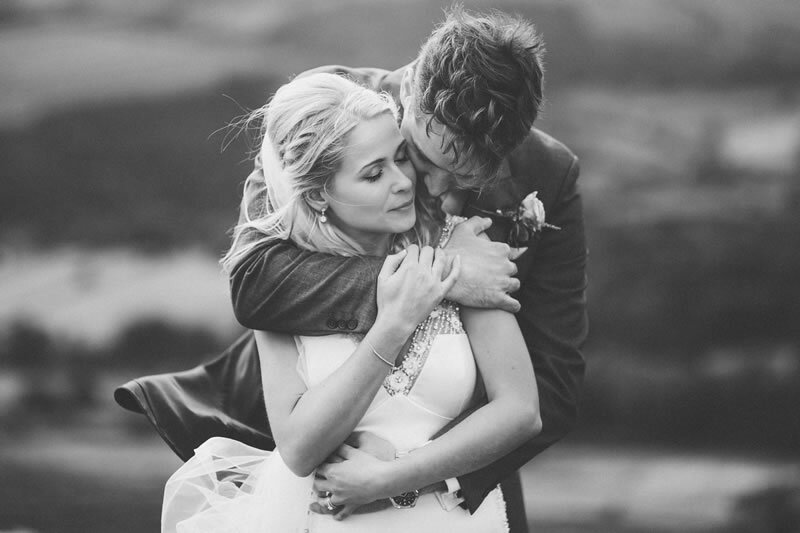 This stunning image was taken in the Peak District on the way to the reception venue from the church, Jess parked up ran up a bit of a hill and found a rock with the most beautiful landscape in the background – the wind added extra movement and she got a huge variety of shots for the couple. Try not to worry about this too much as a good photographer should be able to make the most out of any background. BUT, if you perhaps don’t have much of a backdrop at your venue, and this is something you are worried about maybe you could take a look at the journey you take from the church ceremony to the reception venue before the big day? You might find a hidden gem somewhere along the way! Even arrange with your driver and photographer to stop off at a park or along a pretty country lane, or even somewhere urban or industrial along the way. Construct a plan if you are set on having some edgy photographs taken with a specific background in mind, you don’t want any added stress on one of the most important days of your life! Make a list of who you want in your formal photographs, and give the list to someone who can organise getting everyone together for you – this is a job for ushers! Allow up to five minutes per group photo, this includes getting them organised and getting a variety of photographs with them. 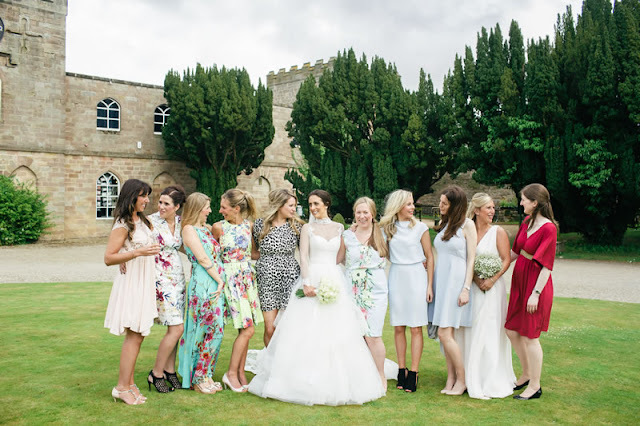 Jess recommends having seven formal group photos scheduled as a maximum – any more and it will start to feel a bit monotonous for everyone involved. If there are any additional photos that you may want with guests, or other family members your photographer can capture these while walking around photographing candid shots of everyone mingling (between the speeches and the first dance is usually a good time). When your photographer arrives on the day to shoot the bride and groom preparations, it’s more than likely that they won’t know anyone. Make sure you introduce them to your family and friends, and other wedding suppliers so they know who is who. If not they won’t know whether the hair and make-up artists are good friends of yours or professionals you have never met before. It’ll save your photographer taking ‘too many’ photos that you will not want in your wedding album, and focus on the ones you do. 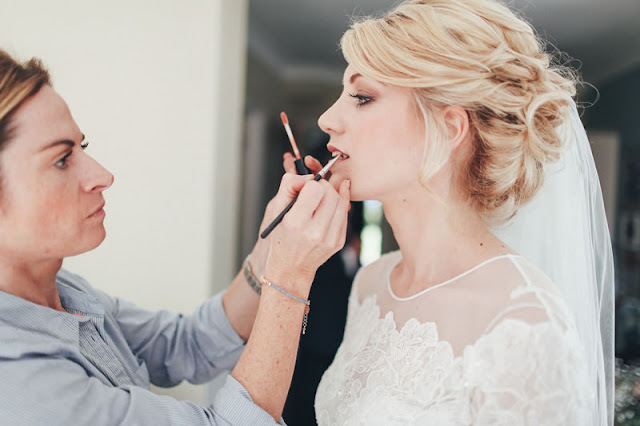 Your wedding day story starts in the morning with you getting ready. Photographers with the same aesthetic as Jess like to capture moments as they happen naturally. She advises that you try to de-clutter the rooms before they arrive and you and your maids position yourselves facing the window before your hair and make-up preparations take place. Natural window light is beautiful – and as there’s lots of thoughts and emotions happening around this time some beautiful images are captured. When planning the layout of the room for the wedding breakfast think about your photographer and where they will ideally be, so they can capture clear photos of you during this time. Generally they will be right in front of you, crouching or sitting so they don’t obstruct the view of other guests. 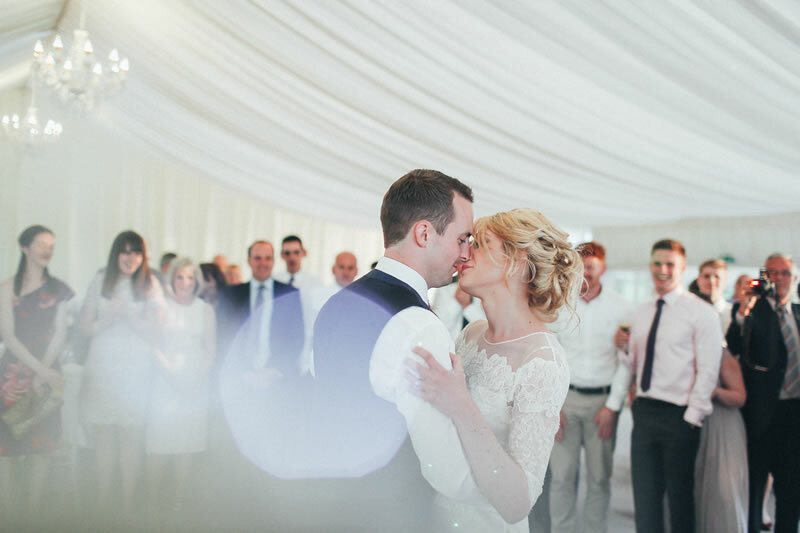 Jess will always have someone else with her at a wedding – one will be standing towards the back focusing on the reaction of your guests, the other right at the front to focus on the top table. If you’re unsure about planning the layout, speak with your photographer about where they will need to be so you will get the best out of your wedding speech photographs. We cannot stress enough how important lighting is! In most religious ceremonies they won’t allow flash photography, so it’s best to see what the light is like prior to the big day and if it is a bit too dark is there is anything you can do to add a bit more light? The same applies for the reception, speeches and first dance – if it’s badly lit can you let in more natural light by opening all the shutters or curtains? Are you able to ‘brighten it up’ with twinkly lights, hanging lanterns, candles and tea-lights? If your budget stretches to hiring special event lighting, do it! These light enhancers can really make all the difference to the quality of your photographs, and add extra ambience and mood to your photography, too. For the first dance and party most photographers, like Jess will have equipment they can use to add brightness.